In the three years since the destruction of Metropolis and the death of The Joker, Superman has overcome many challenges in his efforts to build a more peaceful world. He repelled the whole of the Green Lantern Corps. He survived the combined might of Earth's magical community. And he's subdued many of the costumed heroes who stood against him, though Batman still eludes him and many - such as Hal Jordan - have begun to rankle under his leadership. But can even Superman face the wrath of the gods themselves? This first issue of Injustice - Year Four does little beyond resetting the chess pieces on the board for the next conflict. That being said, Brian Buccellato does a masterful job of establishing the current status quo and revealing the state of Olympus in the Injustice universe. 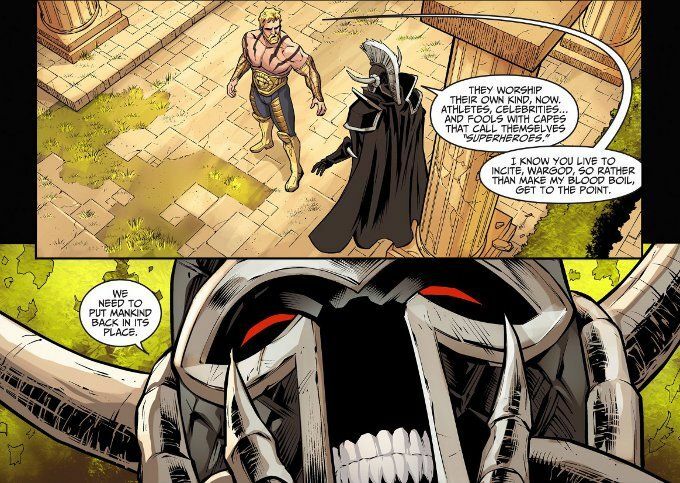 We already know something of Ares' motivations - the world Superman seeks to create will leave little conflict for a god of war to draw upon for power - but the nature of his current game remains an intriguing mystery. The best aspect of this chapter, however, is the new sources of conflict that Buccellato mines for drama and the resulting character moments. It makes sense, for instance, that Hal Jordan - never the best soldier - should grow resistant to taking orders from Superman. Particularly now that Hal wields a fear-empowered ring that may be further fueling his paranoia and distrust of authority. 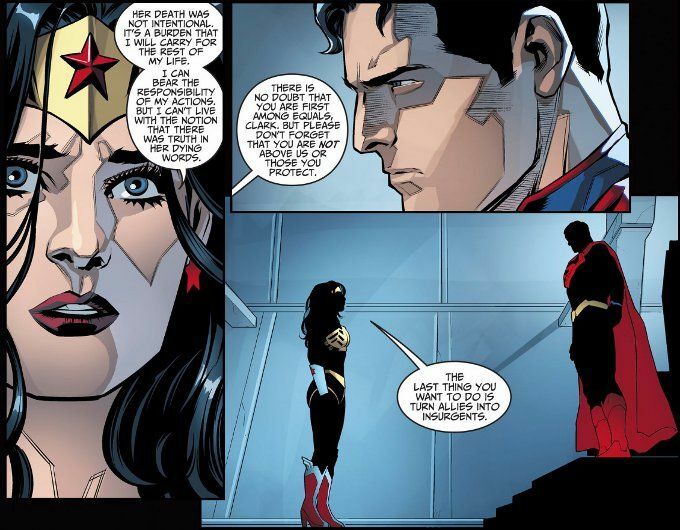 Buccellato's take on Wonder Woman is particularly gratifying, given that the Wonder Woman of the Injustice world has often been portrayed as being one step away from Frank Miller's faux-feminist "hates all men but wants to make babies with Superman" portrayal of the character. Buccellato writes Diana as a warrior who believes in Superman's goals but wisely cautions him against hubris. The usual gang is still at work on the art for this series and it looks as great as ever. Bruno Redndo's character designs are appropriately striking. Juan Albarran's inks are evenly applied. Rex Lokus' colors are as vivid as ever. And Wes Abbott's letters are easily read.